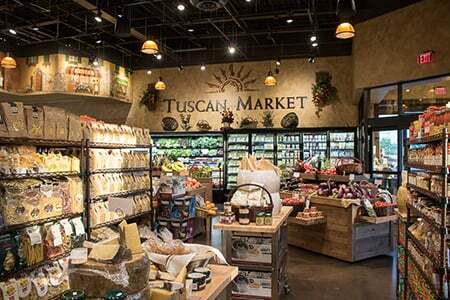 The Tuscan Market in Portsmouth will be moving in the spring from its Lafayette Road location to the city’s downtown. The acquisition of a three-story building in downtown Portsmouth paves the way for the opening of a new Tuscan Market grocer and eatery in Market Square, the heart of the Port City. The acquisition of the 9,317-square-foot building that has long housed the Breaking New Grounds coffee shop was made by J&S Investments LLC, an entity controlled by Joe Faro, owner of Salem-based Tuscan Brands, which owns the Tuscan Market and Tuscan Kitchen brands. Faro is also redeveloping the former Rockingham Park race track into Tuscan Village, a 170-acre retail-residential-commercial project in Salem. Currently, the Tuscan Kitchen restaurant and Tuscan Market operate together in a building at 581 Lafayette Rd. in Portsmouth. Faro is planning to move the Tuscan Market to the new building in Market Square in the spring. According to the Rockingham County Registry of Deeds, the building sold for $4.25 million. Andrew Ward of Colliers International’s Portsmouth office, represented the Buyer, J&S Investments and assisted the seller, BNG Properties LLC, the real estate entity of the Breaking New Grounds coffee shop. “We hope our revamped open-air Tuscan Market will serve as a destination for the local and tourist communities coming together to share in the finest artisan Italian offerings, including house-made salami, artisan breads, pastry, gelato and premier imported Italian coffee both in a café and marketplace setting,” Faro said. Faro said Tuscan Market’s current location will be turned into a banquet event center able to accommodate up to 200 people and is expected to open in the fall. The Tuscan Kitchen restaurant will remain at its current location.